At first glance, Swift looked different as a language compared to Objective-C because of the modern code syntax. Secondly, the strict and strong type system is also different. This talk takes an under-the-hood deep dive into the Swift type system’s structure and gives tips how to use it in a proper way. I’m Manu, and I will talk to you about data types today. Swift is pretty simple compared to other languages, and Swift is pretty clear in its architecture of the typing system. There are two things to know first. First, Swift says there shall not be root - $noRoot. And we will never have nil. There’s no specific root type in Swift. For example, in other languages like Java, or C#, or static type systems, they have a root type. Swift does not have a root type, and empty values are not allowed. 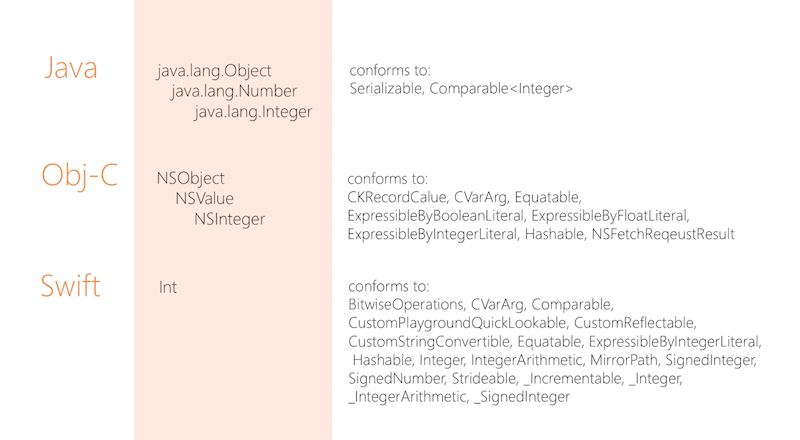 In Java, an Integer is just a number. The inheritance line is not long, but we do have two stages of inheritance over the type itself, with interfaces, which conforms to a protocol. Objective-C is similar, as it also conforms to a protocol. 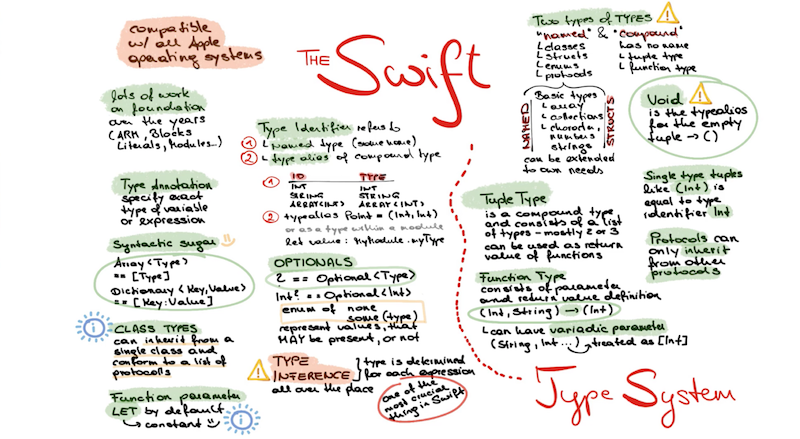 In Swift, Int is a type of itself, and it defines its data types as structures, not classes. 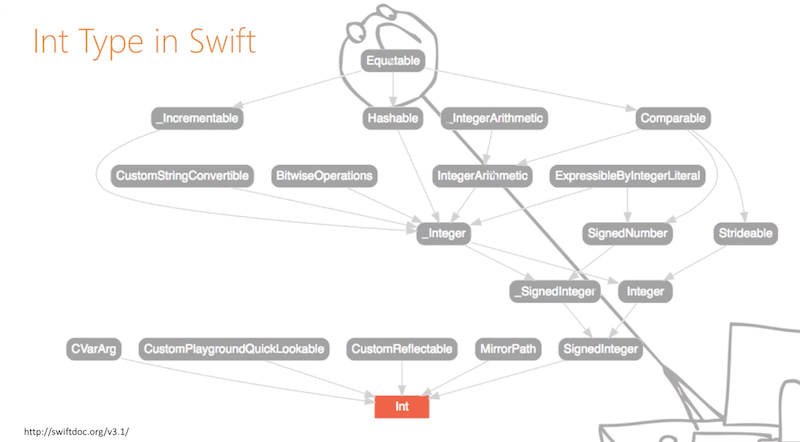 In Swift, everything is a structure with no inheritance. The reason this is done is so we can have super loose coupling among each type, and can be extended throughout the whole type system. This allows for clean architecture. 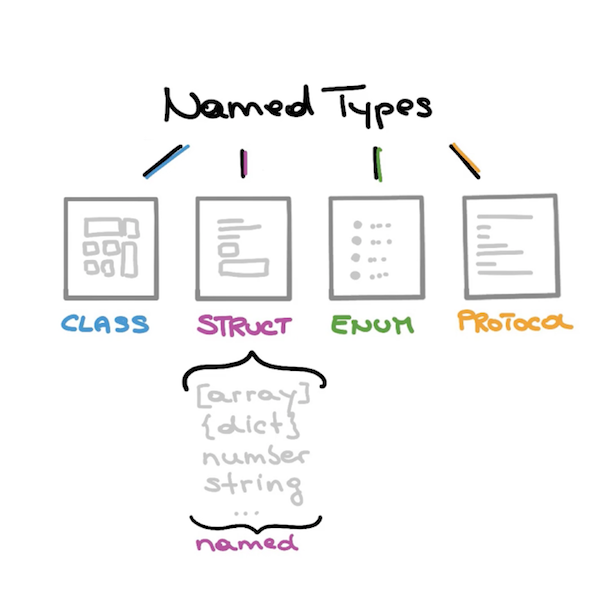 Named types are types that have names. It’s classes, structures, Enums, and protocols; essentially everything you are giving a name when you are using it. A compound type is a type with no name. 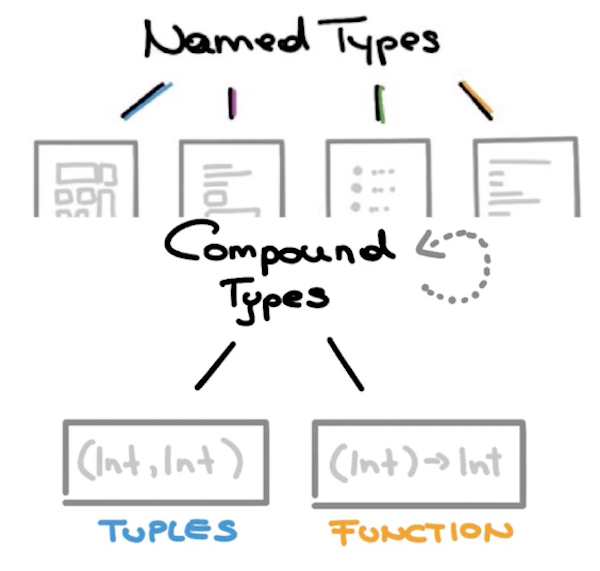 The two types of compound types are tuples and functions. This greatTuple variable has exactly the type Int, Int. This is a real type, it just looks like a bit different. You can attach, or assign a different Int, Int tuple. To do so, leave the parameters, and use the numbers themselves. You can enter the values with the .0, and .1, and so on. Or, you can use the parameter names again. Let’s continue with tuples, and where they are really meaningful. Suppose we want to return more than one value from functions. This is done by just defining the types in the return as a tuple. Tuple types are unnamed but you can give them a name. With the typealias, you can do exactly this. Here, we are defining a tuple of just two Ints. There is a variable named Point. Like tuples, functions types are also common. If I want to return nothing, you can get by with writing nothing. The thing exactly after the name of the function, until the first bracket, is the function type. A lot of programming languages actually have this. I have four parameters for this function, and they are all Int. As soon as you add three dots after the type identifier here, you can use this variable as an array. Treat it like an array and just use it. Closures are very similar to blocks in Objective-C with a few differences. A closure is actually a higher usage of a function type. Above, we just have two types of types; the closure is defined quite similarly to the function itself. This is because it takes the parameters and the area and the return type just as the type signage. This makes functions and closures siblings. The syntax of blocks and closures in Objective-C was often difficult for me to remember, this is why I want to show you the following two URLs. We have sugar on the top in Swift - Optionals. Optionals in Objective-C are not that easy to understand, considering the following definition. This is just an Enum, which has something in it, or nothing. An optional is something or nothing, the value that is wrapped in the optional is your “safety net”. We want to print an optional, and Swift does exactly this. It prints our optional. To forcibly unwrap an optional, you can use a bang operator. This is done like this. var myName : String? = "manu"
If there is no value in the optional, it will fail, and your program will crash. var name : String? "manu"
We are defining an optional, like before; this is just a string which I give a value to, and only continues after the guard block if myName contains a value. Manu Rink is a mobile enthusiast long before there was an iPhone. After working for a couple of years in the enterprise business and creating big data visualisations she finally dropped the mic and made her passion to her profession. For the last four years Manu was working as a mobile software engineer and architect and led the development of a couple of #1 App Store apps. Since 2016 she is a technical evangelist @Microsoft and inspires a wide audience of techies for her beloved topics including mobile development, devops and gaming.